Learn how to assign a task to multiple team members and track the task progress. In some cases, you may want to assign the same task to multiple team members, especially when they are collaborating and you want to ensure it’s on each person’s to-do list. Other times each team member may have to complete the same task individually (such as creating a weekly report). Instead of creating a new task for each, you can simply create the task once and assign it to all relevant people. 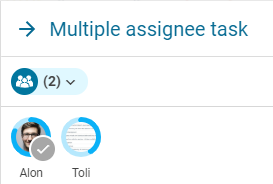 Start by creating a detailed task: Go to Tasks, press the blue (+) icon and choose New Task. 2. Add a title and any relevant details including attaching files and a due date. 4. You can either choose ‘All’ to assign the task to every team member or add only specific people by clicking on their names. 5. If the group contains a lot of members, quickly find the right people by using the search bar. with a progress bar around your icon (photo or initials). 3. When you have completed the task, click the ‘V’ mark to reflect this. Note: As each employee updates the progress or completes the task, the progress of the entire task is updated accordingly.